The year began with a happy note with Sudha bagging the Award for the Best Senior Vocalist for the Season 2010, from the Music Academy, Chennai. She received the award from Nobel laureate Dr. Venky Ramakrishnan. January 2010 had in store for Sudha the GNB Centenary celebrations’ valedictory function where she gave a crisp concert dedicated to her Grand guru and Guru, as a true and worthy disciple of a great lineage. This grand occasion was a fitting finale to the Season, giving Sudha the respite of a few days to rest back and take stock of the Season. Introspecting, happy at the feedback and responses, she also continuously connected with her dear rasikas, thanking them for being with her all through. On 23rd January, there was crisp concert for the XS Real Estate that honoured contributions of Classical musicians and gave away Awards and prize money. The Thyagaraja Aaradhana at Tiruvaiyaru is another ritual that Sudha never misses to follow and is now at the Aaradhana. The beautiful month of Marghazhi came to a closure with Sudha singing in about 18 concert venues spread across the city of Chennai. Battling the distances and the weather, but yet occupying the pride of place in the hearts of her rasikas, Sudha finished her Marghazhi schedule by bidding adieu to her rasikas to proceed for concerts in Singapore. Sudha’s charitable side came to the forefront while she performed a benefit concert for Tanker Foundation, free of cost, as a prelude to the World Kidney Day. There was also a concert for the Swarna Venkatesa Dikshitar Memorial Trust. The Rama Navami concerts were the grand finale for Sudha’s performances during the month of March. 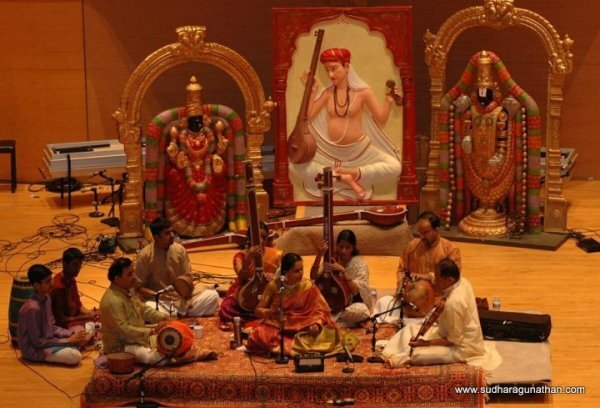 Music, of course, has no barriers and the first quarter of 2010 heralded a global footprint yet again for Sudha, commencing with the Cleveland Ardhana in the US on 3rd April, 2010. Titles and awards were given to various vidwans and vidhushis in their chosen fields and some of them spoke and thanked the organisers profusely. The crowning glory of the awards – the Sangeetha Rathnakara for 2010 was conferred upon Sudha, who took a bow amidst a thunderous applause. The shawl/ponnaadai, the sparkling plaque and a gold bracelet honours were done in the most traditional manner. Sudha went on to give her acceptance speech, beginning in Kannada, much to the surprise of the audience. She first thanked Swamiji for gracing the occasion and conveyed as to how honoured and humbled she felt, receiving this title from him. It was a spontaneous speech, straight from the heart, extempore…nothing written, nothing read out…The words just flowed. Sudha highlighted how the number ‘3’ played a vital role that day… her birth date had 3. Her Guru MLV’s had 3, the day was 3rd April, it was the 33rd Cleveland Aradhana festival, it was homage to one of the ‘Trinity’, Saint Thyagaraja and it was conducted by a ‘Trinity’… V.V. Sundaram, Toronto Venkataraman and Cleveland Balu. The audience gave a thunderous ovation when Sudha called upon all of them to come on stage. This was followed by a concert by Sudha, in remembrance of her Grand Guru, the great Shri G.N. Balasubramaniam and her Guru Smt. MLV Amma. She sang to a packed hall….and she sure felt the spirits of her Guru and Grand Guru pervading the place in all glory…..Shri Gurubyo namaha!